Did you know that your water heater is the second largest energy consumer in your home? The U.S. Environmental Protection Agency reports that a water heater usually contributes to about 18 percent of a monthly energy bill and is second only to heating and cooling in terms of energy consumption. Every time that you use hot water, you’re adding a few cents to your energy bill. That doesn’t mean that you have to start taking cold showers, though! You can save money by lowering the maximum temperature on your water heater thermostat, so that the appliance does not have to work as hard and use as much energy. The U.S. Department of Energy reports that having a water heater set at the highest level of 140 degrees Fahrenheit wastes $36 to $61 annually. Gas water heaters are powered by natural gas. You’ll need to have a natural gas line installed in your home to use one, but they generally cost less. Electric water heaters are powered by electricity and can be used in any home. They are generally the biggest energy consumers. Storage Water Heaters keep hot water stored in a large tank, so that it’s ready on demand. Tankless water heaters heat water only when you use it and do not have a storage tank. Indirect water heaters do not heat water themselves. These tankless units instead use the heat from your central heating system to warm up water. 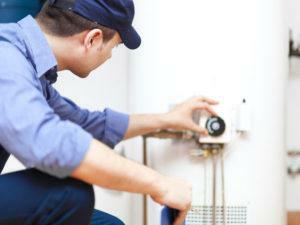 An experienced plumber Sacramento CA service provider can help you decide which type of water heater is best. Our team here at Bonney Plumbing has been in the business since 1978, and we’re proud to have an A+ rating from the Better Business Bureau. If you’re concerned about your water heater, we can come out and inspect it and let you know if you’re ready for a new one. Then, we can help you weigh your options and select the best one for your home. Call us today at 1-800-444-0551 for more information or to schedule a visit.